Six players, including Castleford Tigers’ Jake Webster, have been charged with offences committed in First Utility Super League round two matches over the weekend. Gareth Hock, of Salford Red Devils, has been charged with two offences of reckless use of the knees in a fixture against St Helens played on Thursday February 12. Hock is charged with Grade C use of the knees on Tommy Makinson in the 53rd minute and Grade B use of the knees on Mose Masoe in the 61st minute. Eloi Pelissier, Olivier Elima and Jake Webster have all been charged with offences from the Catalans Dragons v Castleford Tigers fixture played on Saturday February 14. 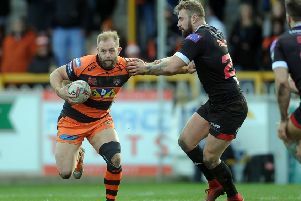 Pelissier is charged with Grade B striking with the shoulder on Castleford’s Scott Wheeldon in the 35th minute; Elima is charged with Grade B repeated punching in the 35th minute; and Webster is charged with Grade A punching in the same incident. Sam Powell, of Wigan Warriors, has been charged with making Grade B dangerous contact on Eorl Crabtree, of Huddersfield Giants, in the 28th minute of a match played on Friday February 13. Crabtree has been charged with making Grade A dangerous contact on Liam Farrell in the 25th minute of the same fixture. All six players were charged after the incidents were considered by the RFL Match Review Panel, which also issued a formal caution to Mickey Paea of Hull FC for use of the knees on Warrington Wolves player Daryl Clark in the fifth minute of a match played on Friday February 13. Crabtree, Powell and Webster have until 11am on Tuesday to submit Early Guilty Pleas. Hock, Pelissier and Elima do not have the option of submitting EGPs and will appear before an independent disciplinary tribunal on Tuesday evening.